With the trip to Hungary in 2013 the new generation was completed. New dancers and musicians joined the group, new members that will be the Udaberri’s backbone for the next years. Udaberri travelled to Belgium in 2008. It was a new and young generation, and the trip was really useful to unite them, and to make them stronger. They offered many performances during a week, and returned with renewed strength. It was a very special year. It was the fiftieth anniversary of Udaberri, and the group organised various celebrations. 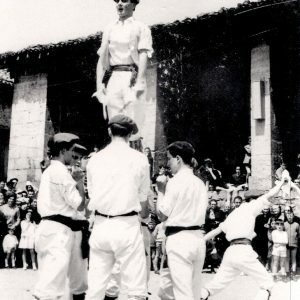 The most important of them was held in June, when all five generations of Udaberri danced in the streets of Tolosa. It wasn’t easy to organise, but it was worth it. The picture of all of us dancing after lunch will be in our memories for ever. For the first time, the group went to Torrelles de Llobregat (Catalonia), and created a bond that has lasted until today. Thanks to that link, adult and younger group members had the opportunity to travel and experience exchanges with another dance group. 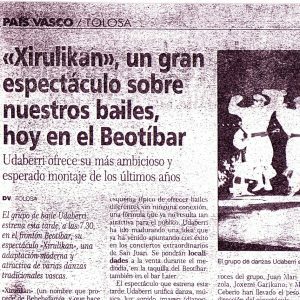 Udaberri continued working on the path opened by Xirulikan, and they prepared a show called Iruditan; it mixed theatre, traditional dance and Basque choreography. The origin and the meaning of the dances were carefully addressed in that performance, because the group members wanted to show them in their original context. 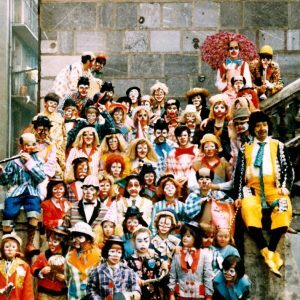 That year, some group members also took part in the operas Leidor and El Caserío. 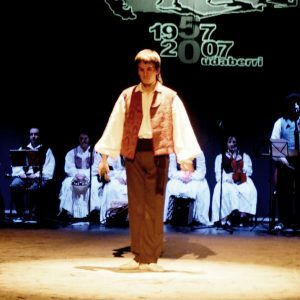 In 1995 the group travelled to Gorizia (Friuli-Veneto, Italy) where it received the UNESCO prize for its work preserving Basque traditions. After lots of consideration, the new generation decided that it was time to adapt their performances to new times. 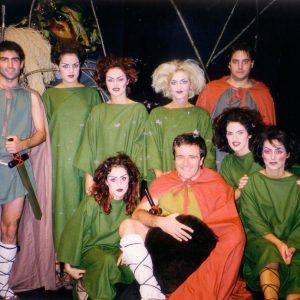 That was the aim of the show called Xirulikan, which was presented in 1992. It was such a success, that they had to repeat the show in 1993, because it was sold out. With the passing of the years, the group changed a lot, with the arrival of a fourth generation of young dancers. 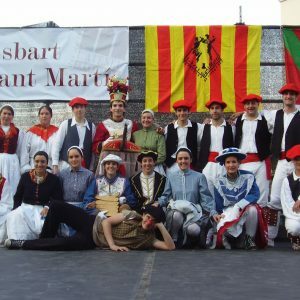 This new group went to Austria, to show Basque dances in Europe one more time. Furthermore, they also went to Valladolid, in Spain. New concerns aroused in the group during the eighties. 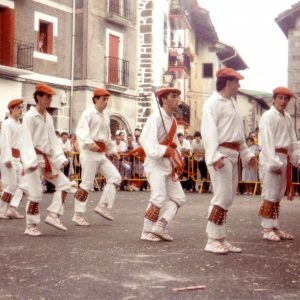 They learnt Basque dances and taught them to others, but some group members realised that they needed to preserve and recover nearly lost dances and traditions. That is why they started studying almost lost dances, like San Joan Iantzak from Berastegi, or Ingurutxoa, from Bedaio. Apart from that, they continued traveling around Europe, and they went to Ireland. With the bloom of a third generation of dancers, 1982 brought two important events. On the one hand, it was the 25th anniversary of the group, and they organised a special show to celebrate. On the other hand, Udaberri travelled abroad for the second time, to Nantes (Frantce). 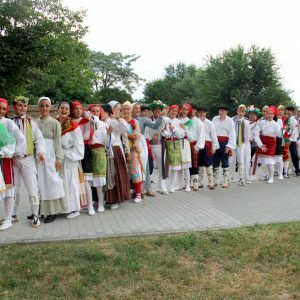 The group offered lots of performances all through the Basque Contry, and finally, they had the opportunity to travel abroad for the first time: Udaberri took part in a folklore festival in the Netherlands. It was the second generation of dancers that opened the way to Europe, and other generations have followed that path ever since. The members of the group realised that they needed to transmit all the knowledge they were receiving. That is why they started teaching dance to younger children. Moreover, it was crystal clear that Udaberri was something more than just a dance group, and this picture is a proof of it. 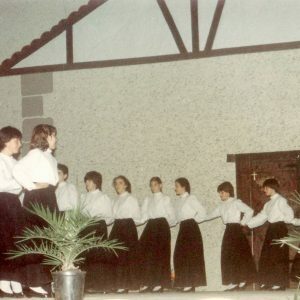 The group members used to organise different activities for their students, apart from dance, always related to Basque culture and its transmission. 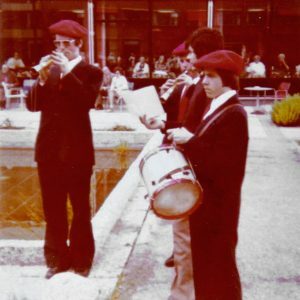 Although the group was formed just by boys at the beginning, there was also a girls’ group working with Juan Ramon Arteta in Tolosa, and both of them decided to join each other, and to form one main group in 1963. At that moment, it was Arteta himself who took the lead of the newly born mixed group. Udaberri Dantza Taldea was created in 1957 by two priests: Xalbador Garmendia and Felix Galdona. 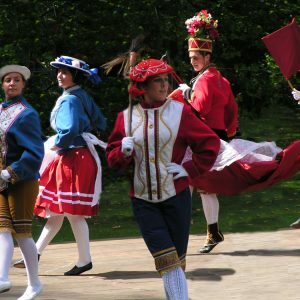 The last years of Franco’s regime brought a second Renaissance of basque culture, and that movement was the origin of many dance groups. 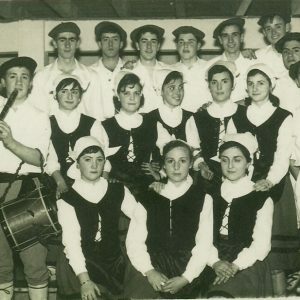 Those first years, Udaberri only had a few members, some boys from Tolosa and its surroundings, and a couple of txistu (basque flaute) players.